This IBM Redbooks publication documents and addresses topics to provide concepts to setup a complete infrastructure environment and tune the applications to use IBM POWER9™ hardware architecture with the technical computing software stack. This publication is driven by CORAL project solution. 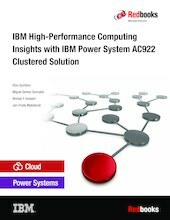 It explores, tests, and documents how to implement an IBM High-Performance Computing (HPC) solution on POWER9 by using IBM technical innovations to help solve challenging scientific, technical, and business problems. This book documents the HPC clustering solution with InfiniBand on IBM Power Advanced Computing (AC) AC922 8335-GTH and 8335-GTX servers with NVIDIA Tesla v100 SXM2 GPUs with NVLink, software components and the IBM Spectrum Scale parallel file system. This solution includes recommendations on components used to provide a cohesive clustering environment which includes job scheduling, parallel application tools, scalable file systems, administration tools and a high speed interconnect. This book is divided in three parts: Part 1 focuses on planners of the solution, Part 2 focuses on the administrators, and Part 3 focuses on the developers. This book targets technical professionals (consultants, technical support staff, IT Architects, and IT Specialists) who are responsible for delivering cost-effective HPC solutions that help uncover insights among clients’ data so that they can act to optimize business results, product development, and scientific discoveries.